IAM makes it sound like some kind of popularity contest, having gone with the headline “Chinese companies still have some way to go to catch up with Asia’s leaders at the PTAB” (“catch up” with “leaders” implies competition on paperwork, not production and innovation). What we’re attempting to highlight here is not just IAM’s bias but also a bizarre mentality, in particular as far as it relates to invalidation of patents. The so-called ‘IP community’ has lost sight of what this system was supposed to be all about (or for). There are even ruder comments about Breyer in other sites, including Patently-O. Every judge or official who stands in the way of patent maximalists is typically discredited, demonised, declared incompetent. We covered several examples of that in recent weeks. They’re being bullied or marginalised for saying the truth while holding a position of power/influence (such as the Supreme Court). MIP’s coverage of the Couzzo case said: “Patent Trial and Appeal Board (PTAB) observers are split on whether the Supreme Court will allow the broadest reasonable interpretation (BRI) claim construction standard used by the Board in inter partes review (IPR) to survive, following oral arguments in Cuozzo v Lee on April 25. Patent Trial and Appeal Board (PTAB) filing was up to 148 petitions in April, according to data from the Docket Navigator database. This consisted of 136 inter partes review (IPR) petitions, 10 covered business method (CBM) petitions and two post-grant review (PGR) petitions. The number of petitions in April was up from 118 in March and compares with other figures so far this year of 150 in February and 99 in January. The number of petitions filed in April this year were roughly comparable with the 146 petitions filed in April 2015. And going back to MIP we have this: “While granting Tire Hanger’s motion to amend, the Patent Trial and Appeal Board approved “grouping prior art references together according to their particular teachings” and “discussing only a representative few in its motion to amend”. 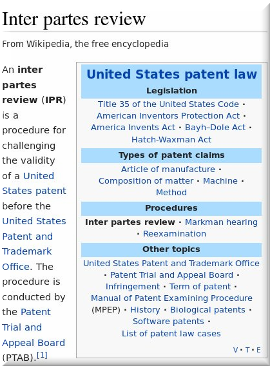 This may provide guidance to other patent owners seeking to amend claims” (so as to maintain borderline invalid patents).